Woot! Two Twenty One Talk is back in action. Thanks for your understanding with the brief hiatus. I know you missed the soothing sound of my voice. A couple weeks ago the hard drive on my computer failed unexpectedly right before I left for a 12-day vacation and I thought I lost everything, including my latest Two Twenty One Talk interviews. Well, my computer is donezo (RIP) but after forking over $160 they were able to extract mostly everything from the hard drive. BUT they couldn’t salvage some stuff which is why I’m very thankful that Brad set up an external hard drive to automatically back up everything on the computer every day. So invest in a techie partner and an external hard drive. It will save you tears and the guilt of stress eating. 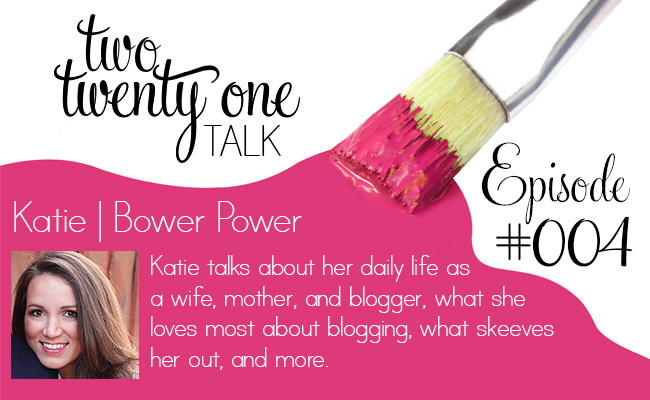 My guest this week is Katie Bower from Bower Power. Sit back, relax and enjoy my conversation with Katie! You can now listen to TTOT on iTunes and Stitcher! Do you have a favorite blogger (other than me, of course) that you’d like me to talk with? Tell me in the comment section. I consider Katie to be a friend so I would’ve hoped she would say yes to chatting with me while I record it. Hah! When I listed to the podcast it when dead air at 48 mins. It was still playing but no sound. Ugh. Thanks for telling me! It was a glitch in the editing software. So if you fast forward to 50 minutes it’ll pick up. I’m going to try to fix it and reupload it. Hi! I just got to listen to this and loved it! It was a great way to spend the afternoon when the baby was sleeping and DH was at the gym! Thanks! Thanks so much! I’ll see if I can bribe Jen and Sherry into chatting it up with me. I have to tell you, I’ve been reading your blog since the wedding planning days (I was planning our wedding around the same time). I enjoy keeping up with what you are creating, and with your family! I was so excited when you announced that you were podcasting, since I listen to podcasts during my commute. I have been loving your series, and look forward to each new episode! Thanks for making my drive WAY more fun! Aw, I’m so glad you’re liking the podcast… and keeping up with our crazy adventures! And I’m glad they make your drive to work more enjoyable vs less enjoyable. Hah! Haha! Yes, definitely more fun! I finally got around to listening to this. Katie makes me laugh so hard. I have followed the Bowers for a long time now and so glad to get to hear her talk about life and blogging. Thanks for sharing! I follow several different blogs and I am always inspired by Sarah at Thrifty Decor Chick and my new favorite is Jenna Sue at Jenna Sue Design Blog. Glad you liked the episode! Good suggestions! I’ll add them to the list. First off I love the whole podcast idea! Listened to a few of yours and they are great and entertaining! I would love for you to interview Michelle from Decor and the Dog! Yay! So glad you like them! Ooh, I’ll see if I can get her to chat with me before she pops that baby out. Do you have a website where I can purchase some of your items? I am really interested in the TV stand you made out of a dresser!! Unfortunately, 98% of the stuff in my house isn’t for sale. Sorry! I LOVED this! Katie is hilarious! I feel like I “know” her way better now than I ever have reading her blog for years…I feel like her and I could be friends…It’s the mix of ditzy and funny and I mean that in the nicest way possible.